We are a family owned club doing business since 1978. Our mission is simple: We Change Lives, because we CARE! We want to help you Change your Life! The reality is none of us have much time to exercise. Exercise when you want at DeKalb and Sycamore’s largest 24 hour gym. 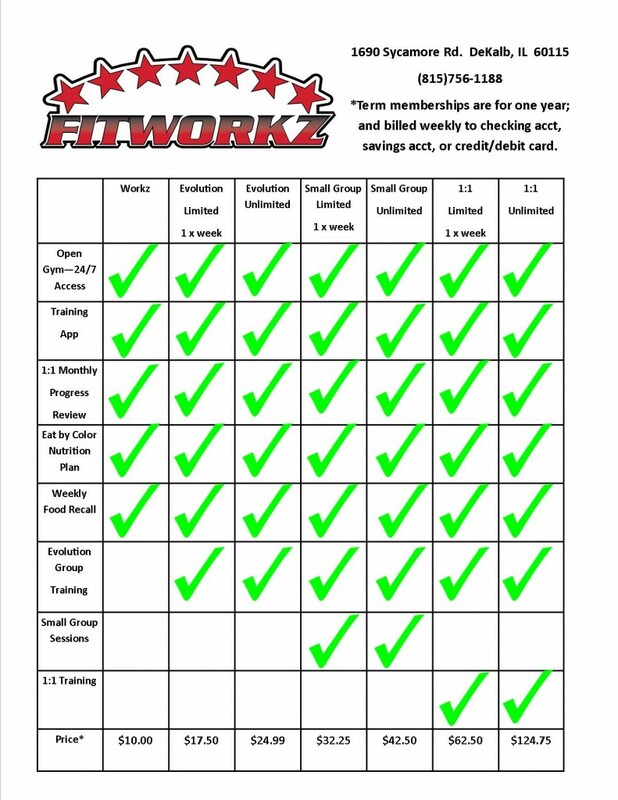 FitWorkz is open 24 hours a day, 7 days a week for your convenience. Have you joined a gym in the past and then wondered how to use the equipment? If you knew how to do some exercise, did you wonder how to put an exercise program together that actually worked? Our digital training app gives you a new workout in the palm of your hand. On your smart phone or tablet, you get a new workout every month. To make sure you know how to do the exercises, there is an exercise instruction video of each exercise. All of the exercise videos were shot at FitWorkz on our equipment. Food is 80% of your success or failure. We all know diets do not work. Eat by Color is as easy as children’s paint by number. Learn to eat more of the foods you like with your Eat by Color plan that will help you reach your goals. No calories, no macros, or pints to count. Every week we review your eating habits and provide feedback focusing on what you are doing right and giving suggestions to make eating right easier. Every month, we will have a 1:1 progress check in with the trainer. This is critical because for example MOST women see the scale go up 1 –2 pounds in the first month*…usually they are losing a dress size or two in the process. Progress is the most motivating thing on the planet and the scale often does not show progress! Large group functional training; Accomplish more with less time spent in the gym. See results with functional training in only 2—3 hours a week. Every week is a new workout in this fun team environment. Smiles, laughs, and results*! Small Group Training uses the best of the best of our personal training programs. The same workouts and programs we use with our competitive 1:1 clients. Small group members have the baseline performance tested and measured, and do so every 6 weeks while in the program. See your improvements in how your fit AND your ability to move. Maximum calories burned in the shortest amount of time. If you are returning to exercise from an injury or have never exercised. Maybe you have a very specific goal and time to hit it. 1:1 training is all about you and your goals. The training is customized and tailored to your needs and goals.